NOTE: I met June at an event for parent bloggers, and earlier this year when Lion City Adventures came out she organised a fun giveaway on Facebook. (Thanks again, June!) 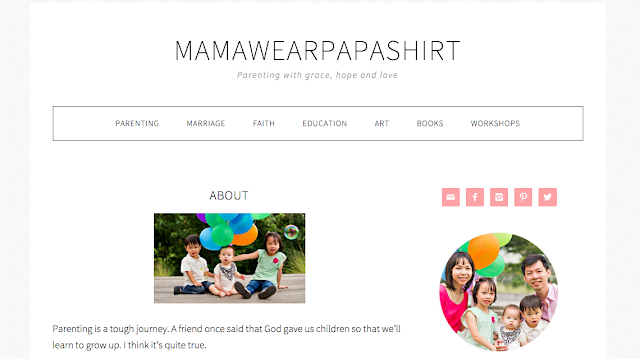 Her blog, charmingly titled mamawearpapashirt, is all about "parenting with grace, hope and love". Most delighted to introduce her here! Hello, and do tell us what you do! I'm June, writer behind mamawearpapashirt — a blog focused on sharing parenting tips, ideas, and lessons learnt in my own journey as a mother. I love to write and encourage others with my stories. As parents, we're all learning on the job, and often muddling through, so I believe stories help us to connect and learn from one another, making the lessons more real and applicable to our everyday lives. What’s the role of stories and books in your family? We've read to our children since they were babies. And even today, we still enjoy exploring picture books with them. There's no end to reading. The beauty is in the journey, in the way the story sets us free, brings us to another world, challenges our thinking, or lets our imagination run wild. Our eldest reads independently now, and is devouring chapter book after chapter book. And all we did was read with her, no phonics classes or anything like that. It naturally clicked when she came of age. She also helps to read books to her younger siblings, so I would say books are great in helping us bond and grow as a family! 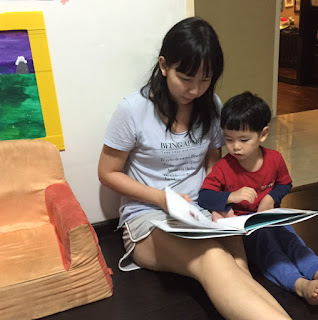 As a parent, how do you choose stories and books for your kids? I like to expose the kids to a variety of different genres — from the must-have classics like Eric Carle, Julia Donaldson and Oliver Jeffers, fun books like Press Here, and moving books like The Giving Tree by Shel Silverstein. The books we love tend to make us laugh or react in some way emotionally, not just all in the head. Our current faves are The Dot and Sky Color by Peter H Reynolds. We also draw on practical books that help us explore and talk about emotions like anger and sadness with the children — like I’m Tired And Other Body Feelings by Clare Hibbert. If you could write your own book for children, what sort of story would it be? I would love to write a picture book some day. Ideas come and go, but I think it could be about a boy who finds joy in creating things with his hands, and offers them to the down and out, giving away a hint of magic and hope. Check out her website here, for great parenting insights and tips for the family.